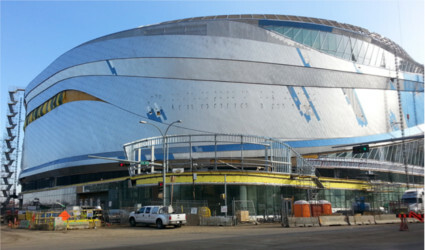 The iconic new arena and home of the the Oilers in downtown Edmonton. We need to provide layout to inform the installer where to locate a projecting bracket sitting on top of a sloping box beam. Once installed, a hole in this bracket needs to align with a hole in the back face of a vertical cladding rail. And how do you get the information to locate this theoretical hole, it’s elevation, how far towards or away from the building it should be, how far it should be to the left or right on the building and how it should align to various parts of the structure in its vicinity? – all needed to make this work. The answer is from a 3D model. Due to the vast amount of tiny bits of information that were needed to be extracted from the model to make this plan all come together we had to do some tricky little maneuvers. By developing software code we were able to automate the extraction of much of the data thus enabling RTS to react quickly as information became available. And then there’s the glazing... Curving at the head AND in plan, with differing types of brackets, with some parts propped while others are hung, this had its own challenges. – Oh! and of course, there are areas where considerable deflection is expected. So this means that the layout has to effectively be done “wrong” in such a way that once all of the load has been applied, the glazing and supporting structure will be “right”. This project never had a dull moment, especially when fighting numerous other contractors all trying to access the same areas, but we think that the end result was well worth the effort. For this Project, it is hard to portray the scale and complexity in Photographs alone - to really appreciate what a funky building this is, try a very short Video fly through, a presentation by the City of Edmonton uploaded to youtube by CTV News Edmonton. Alternatively you can search for "downtown arena fly through (city of edmonton)", on youtube which will take you to the same place.